Apartment buildings should be smoke-free zones just like workplaces, restaurants and bars. That’s what a new study suggests, which researchers say, for the first time, documents how secondhand smoke can transfer from one apartment to another. Scientists at the Roswell Park Cancer Institute (RPCI) in Buffalo, New York conducted a small study measuring air quality from 30 apartments in 11 different buildings. “This study suggests that individuals who live in apartment buildings are particularly susceptible to secondhand smoke exposure in their homes.” says Brian King in a press release. He is with the Department of Health Behavior at RPCI. The study authors believe establishing a smoke-free zone is the most effective way to “protect apartment residents and their visitors from exposure” because tobacco smoke can leak out of a smoker’s home through doorways and the ventilation system. Lung cancer from secondhand smoke kills about 3,400 adult nonsmokers each year, according to the Centers for Disease Control and Prevention (CDC). The agency also estimates that 46,000 heart disease deaths each year are the result of nonsmoking adults being exposed to cigarette smoke. Also, nearly 40 percent of children are exposed to secondhand smoke, according to the American Academy of Pediatrics (AAP). Efforts to restrict smoking in apartment buildings are not new. Recent efforts in California and Washington have not led to an overall ban. Smokers on the other hand, believe they should be able to smoke in their homes, even if that should be in an apartment. « Previous entryDoes your doc get money from drug companies? This is total baloney!! three is no way the CDC has to determine that 46K or any other amount of "non smokers" had heart disease, or "died from cancer" caused by second hand smoke. Teh CDC knows darn well that thousands of non smokers get cancer and heart disease every year, many thousands of whom were NOT EXPOSED TO SECOND HAND SMOKE at all. There are millions of pollutants in the air, in homes, and any where else....that could cause heart disease and cancer, and they are blaming it on second hand smoke because no study can determine what other pollutants may be causing cancer or heart disease. For example, did the CDC do a study on the amount of radiation that is emitted in BUILDINGS all over the U.S.? I read about that study last year (can't find the article at the moment).....and no agency is looking into it. It is outrageous that a ban should be imposed on smoking in your own home, or even outside in parks, and other public places. The public is scared silly by this nonsense.....to the point that someone passing a person on the street, or smoking outside a building, thinks he or she is exposed to the second hand smoke at a level that would cause harm. . The "smoking police" are everywhere, and they are quite annoying. My own mother was exposed to second hand smoke for 50 years (my dad smoked like a chimney) and she lived to 86 years of age cancer or heart disease free. So I don't believe this nonsense. Does smoking cause cancer and heart disease? Of course it does. But it is total nonsense that second hand smoke causes this. Also, be aware that your mother's particular situation means (literally) nothing in the context of this article. A sample size of ONE cannot produce results even remotely approaching meaningful. Your obviously complete misunderstanding of statistics leads me to discount your second sentence (among others). From now on, I'd suggest you let the scientists make the scientific claims. You might avoid looking quite so ignorant. No this is not baloney! smoke from my neighbor gets in my bedroom through the electrical outlet openings. my bedroom smells like smoke-like i smoke-and i don't! after a smoker moved in next door i started wheezing. they don't ventilate so in order to keep from wheezing, my fan blows in fresh air all winter-and i mean even if it's 20 out there. another non-smoking neighbor now gets bronchitis and as i write, is recovering from pneumonia. the smoke does get into the hallway-and her lung problems aren't caused by any accidental transmission of smoke. the smoker next door does't like smoke either so she leaves her door open to ventilate. so when she smokes everyone nearby does too. (and yes we tried management who smoke too so 3 guesses where that complaint went....?!) would it be tolerated if an alcoholic's drinking caused panceatic cancer in people living next door? and smoking is always an addiction while drinking is not. why should i face the same health problems a smoker faces? i'm not the one smoking! Look, Rob....you don't know what YOU are talking about. If you would actually read these studies and see the controls they used you would see that most studies are done for the purpose of proving a preconceived notion and there are many scientists who are paid to "prove" something or other. I am not so "ignorant" to believe that my mother's lack of cancer or heart attack proves my case....it is just one example. I am sure there are thousands of others. Do these studies tell you how many people actually DID NOT get cancer or heart disease who WERE exposed to second hand smoke? do they tell how HOW MUCH second hand smoke they were exposed to and for how long and how often? Have you seen any statistics on THAT? For Heaven's sake, passing someone outside your building who is blowing smoke in the AIR (NOT IN YOUR FACE), even once or twice a day, is NOT GOING TO CAUSE CANCER OR HEART DISEASE. USE YOUR COMMON SENSE! think for yourself. For your information, I have taken several courses in statistics when in college and know the falacies behind many of these "studies" made public, with little explanation as to the controls in place in the study. For example, in the study on HRT (hormone replacement therapy) done in 2002 , the average age of the participants was 63. Did the media point out that the average age of menopausal women is actually 53? So, somehow, this was a surprise that the study "revealed" more women in that study were getting strokes and heart attacks.? Then everyone panicked because the media blew the study out of proportion and doctors saw lawsuits in the making and refused to prescribe HRT to people who had severe symptoms. Even the full study (which I read in full, by the way) says each woman is different and each woman's case should be handled by determining the need for HRT based on symptoms, not on STATISTICS from flawed studies!! If you followed up on these studies you would find MANY DOCTORS who agree with my assessment. Did you know that most studies in regard to marijuana usage are done by the government.....trying to PROVE that marijuana is harmful , and that there are hundreds of other studies, ignored by the media, that prove otherwise? These studies are also done by reputable scientists, not paid by the government. Would you like to see them? In fact, I read a study last year that showed that marijuana usage could actually ward off or delay Alzheimers disease.....because it helps to reduce inflamation in the brain that is suspected of causing Alzeimers? Did you read that study? or are you one of those who only believes the studies that "prove" your own beliefs? I am a college educated woman who is no "ignoramus". Why should nonsmokers be forced to breath air that has been voluntarily polluted by their neighbors. Those smokers would object if every few hours their neighbor took a toxic pesticide and sprayed their patios and doorways-with special focus on the gaps under and around the door. Elle, no where in my post did I contend that smoking in an apartment can not get into another apartment. That was not my point at all. My point was.....HOW MUCH SMOKE got into those other apartments, and how many people living in apartments get cancer or heart disease from this kind of second hand smoke? You write: another non-smoking neighbor now gets bronchitis and as i write, is recovering from pneumonia. You have absolutely no knowledge or proof that this person came down with bronchitis or pneumonia from the second hand smoke getting into her apartment. The bronchitis could have been caused by the outdoor air quality (don't know where you live), and if anything.....the second hand smoke just prevented her from recovering as fast as she might have, or just irritated an already existing condition. I am not saying second hand smoke causes "no damage" to anyone, but I believe it is slight. I am saying the population believes it only takes a little second hand smoke to cause these diseases, and I do not believe that for a second. The media are the ones responsible for the hysteria caused by these studies....some of which are frequently flawed, and many of which are then negated by a follow up study. Read between the lines; think for yourself; ask questions; read the full study yourself; and THEN DECIDE. Is that similar to "where there's smoke, there's fire"? (I had smoke in my kitchen from cooking......but there was no fire in the pan). I must be "ignorant" because I have no idea what your statement about horses and zebras means in relation to this article. Where are you? did you post and run? LOL. and smoking is always an addiction while drinking is not. What planet are you living on that you think drinking is not an addiction? LOL. Is "second hand smoke" an addiction? your analogy about pancreatic cancer and drinking is just plain irrelevant and nonsensical. Is someone going to get "second hand pancreatic cancer". Don't make me laugh! Do a little research on "addiction" and the defiinition of "addiction", whether it be drugs or cigs or anything else. Addiction being a "brain disease" is also a crock!! It is a choice! Marion, your need to defend yourself in such an over the top way shows how little perspective you have. obviously a smoker. obviously an addict: the denial, the anger, the bargaining... feel free to kill yourself, but far away from the lungs of everyone else please. &oh- the lady with the pneumonia? had zero! zilch! no lung problems till the smoker moved in. her lungs changed within the first month-one month of second hand smoke! so please refrain from attacks please. smoke all you want! just find a way to keep the byproducts of your addiction away from my lungs. please. would you allow a drunk driver to keep his keys knowing he'd be sharing the same highway as you? that's called perspective, by the way. have a blessed day. This happened to my neighbor too–she had no lung problems at all! Then a smoker, then she gets asthma, and sleep apnea. I have heard this time and again. Another neighbor had reoccurring bronchitis after a smoker moved near her. If smoke can penetrate the firewalls, so can fire. It sounds like building inspectors should be called to try to bring the building up to code. I stopped smoking indoors back in the 90s to protect newborn lungs and do not regret the lack of smell, stain, fuzz, and aching head from stewing in smoke. Just stick yer head out the window and puff away, why is this a hard thing to do? It's easier than getting dressed for the outdoors. A coat will protect your upper body as you survey your smoking kingdom outside your window. All positives, no negatives except for weather extremes. Yessss! I quit smoking 2 years ago, my lungs are very sensitive and I suffer from infection in my lungs not bronchitis. I live in a hud apartment, the air conditioner won't accommodate good air filters, the air conditioner, window and door all face the back where people smoke continuously. I am living with secondhand smoke every day, 24 hours a day. MY lungs were getting better until I moved here. This is suppose to be a smoke free building yet people who smoke still smoke in the building. Please do not tell people to smoke out of their windows the smoke gets into other people apartments. I wake up to smoke and go to sleep smelling smoke, my pj's always smell like smoke. The only way I can air my apartment is by opening the hall door, but then people spray those horrible air fresheners and I am allergic to most smells of this kind. Anti-Smokerism is a crusade that has been inflated by both exaggeration and downright malfeasance, fueled by the awarding of fat grants and salaries to any scientist who'll produce the "right" results. The Anti-Smoker "scientific" community is a tight clique of like-minded scientists and bureaucrats, who give each other jobs, publish each other's papers - and conspire to shut out any point of view that threatens to derail their agenda and/or gravy train. Such behavior from scientists is a travesty. In the end, grievous harm will have been done not just to individual scientists' reputations, but to the once-sterling reputation of science itself. For that, we will all suffer. Men in white coats are not unquestionable Gods. They are humans as capable of being unethical and lacking integrity as the next guy. Any that say that cigarette smoke from one's apartment can harm anyone in another is downright lying. And any person who anecdotally claims to have been affected are downright lying to themselves and are the victims of their own minds. I don't doubt you get sick but it's hysteria manifesting itself into being ill. Cigarette smoke is not some most unique substance on earth. If people do not have the same physical reaction to barbeques, fireplaces, vehicle exhaust, campfires, airplanes (exhaust at airports), cooking fumes, etc. then it's your own mind turning on you. I should not be held captive to your hypochondriacally manifested physical ailments. You've kicked us outdoors, then want the outdoors too, and now want to "own" our homes. We've had enough of you people. No more. You are completely and unequivocally delusional. 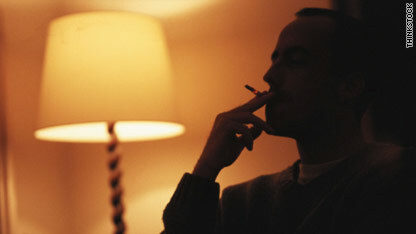 In reality, cigarette smoke contains in excess of 4000 chemicals, 50 of which have been shown to cause cancer in humans. The constituents of barbeque smoke and vehicle exhaust do not even begin to compare. I strongly urge you to get a clue, followed by some fortitude to overcome your addiction. Thanks. John, I'll answer simply. Get one nonsmoker to lock themselves in a sealed garage with, oh, I'll even go as high as 100 people smoking. And you can lock yourself in a sealed garage with one running car. Dare to "compare"? The reality of the situation is that no one in their right mind would choose to put themselves in either of these situations. A waitress or bartender working in a smoke filled restaurant or bar are exposed to 100+ cigarettes on a daily basis for months, even years. These individuals then develop lung cancer and a host of respiratory ailments when they have never smoked a day in their lives. In the end, it's no surprise that jury after jury has ruled in favor of these hospitality workers – secondhand smoke is lethal. Amy, please cite several U.S. cases. You might be able to come up with one (maybe). But "jury after jury"? Who's lying now? As for the remainder of your assertion, not even the EPA report of 1992 that began all this could offer support for it. Their study (flawed as it was to begin with) was on smokers living with nonsmokers for over 40 years and even then the STATISTICAL increase in risk for contracting lung cancer was an extra 2 people in 100,000. And you now want to assert that bar workers who only spend a fraction of that time (who waits or bartends for more than a few years?) are all at risk? But back to the point you diverted away from... If you are that afraid of cigarette smoke you then must be that afraid of vehicle exhaust. But funny, no one is. Marion, you're out of touch. I lived in a 4-unit apartment building and the tenants in only 1 apartment smoked. The hallways stunk like stale smoke. Every time that tenant opened her apartment door, the stench immediately filled my apartment. I would be wakened in the middle of the night to the strong smell of smoke from that tenant and her puffing guests. In 4 years, I was put on disability 3 times for COPD. I got the heck out of there. Your smoke stinks everything up and you don't know it because your sense of smell has been so compromised. You are so intent on killing yourself that you don't care about anyone around you. Secondhand smoke causes breathing problems, ear infections, throat problems and a whole lot of health issues for everyone. If you have kids, you're poisoning them. Argue the benefits of smoking if you want. You can't convince anyone including yourself, but keep trying. Cigarette smoke, any smoke, it hurts to breathe it all. Exhaust from cars, trucks etc. I quit smoking to breathe. I don't live near highways, or smoking grills, just secondhand smoke from other apartments and this is a smoke free building. Stop defending cigarette smoke it's sounds to me like you smoke and are avoiding the fact that you have to quit. When you cough your lungs out and go to the emergency room because you can't breath you might do something. I didn't wait for this to happen but because of smokers after I stopped I ended up in the emergency room and now I use oxygen. It was that little push that sent me over the cliff. This is the reason WHY Dr Gupta did not get the Surgeon General post. He is so in bed, as is the FDA, and the American Cancer Society with the Johnson and Johnson "family" of drug companies, who sell Nicoderm, Nicorette, Nicotrol, Nicoderm CQ, and Commit, that his confirmation would have exposed the entire bought off, grant funded non science that is being spewed by Gupta and the spongers. CNN and other media will never report the truth about second hand smoke OR the connections between the Robert Wood Johnson Foundation with the FDA, the EPA, the Cancer Society, OR the Whitehouse, as that would end the incredibly lucrative drug company ad revenue to them. I would like to see ONE of these propagandists swear to any of this "science" under oath. THey won't. They would go to JAIL for perjury! The object of smoking bans is to ostracize and demonize American citizens onto the products of the J&J... (Astra Zeneca, Glacxo..and 247 other J&J companies.) IF the government wanted people to stop smoking, they would ban the selling of it. THey won't. That would also kill the selling of all the nicotine replacement products of J&J, and end the billions of dollars in grants that flow through our once respected non profit foundations, and into our government agencies. The state and federal governments make more on tobacco products than the tobacco companies do. NOW are you starting to get it? FOLLOW THE MONEY! I could care less who is making money from corruption. If everyone would stop smoking and polluting this world would be a better place and the cigarette companies would go out of business. Also, the subject (we are discussing) is cigarette smoke not exhaust or any other pollutant. Who says because they think smoke is bad for people other pollutants are not. There is a difference between driving a car which is a necessity and smoking cigarettes. You are getting things a little confused aren't you! I’m Robert E. Madden MD, FACS. I am also a non-smoker. HOWEVER I am a passionate opponent smoking bans. Most of the opposition to the smoking bans has been based upon economic factors such as loss of business revenue, even closings. My opposition is due to loss of individual freedom and abuse of scientific fact. I am a practicing chest surgeon, a teacher and a former cancer researcher. I am also past president of the NY Cancer Society. I will not tell you that smoking is harmless and without risk, in fact one in eight hundred smokers will develop lung cancer. Asthmatics should avoid tobacco smoke. What I will say is: 1) it’s a personal choice and 2) so called second smoke (ETS) is virtually harmless. One may not like the smell but it has not been shown to cause cancer, even in bartenders. If people do not like the odor then they may go elsewhere. Those who support the ban have no right to deny 24% of the adult population their enjoyment of a popular product based on dislike, possibly hatred of smoking. This attitude is that of a bigot, akin to anti-Semitism or racism. To me the most offensive element of the smoking bans is the resort to science as “proving that environmental smoke, second hand smoke, causes lung cancer”. Not only is this unproven but there is abundant and substantial evidence to the contrary. It is frustrating, even insulting, for a scientist like myself to hear the bloated statistics put out by the American Cancer Society (of which I am a member) and the American Lung Association used to justify what is best described as a political agenda. Smokers enjoy smoking. Most non-smokers are neutral. Anti-smokers hate smoking. It is this last group that drives the engine of smoking bans. Smoking sections in restaurants, ventilated bars and the like have been satisfactory and used for years. To those who choose to smoke they do so at their own risk. To those eschew smoking let them patronize establishments whose owners prohibit smoking. To impose a city wide or a state wide ban is to deny people of their rights. I can't stand the smell of smoke. I lived in an apartment and couldn't even sit out on the balcony without smelling it and coughing from it. We could never open our windows. It would be much nicer for us non-smokers if smokers had to walk 200 feet away from the building to smoke. There are SO MANY non-smoking apartments now, why woudn't you just choose to rent in a completely non-smoking community?? First, I would like to state that I do not smoke. For those that do, I apologize that there are non-smokers that have possibly given you a tough time. In no way do I blame the smoker for this issue regarding smoke going into neighboring apartments. Instead, I blame the apartment complex's. These places could seek alternatives that could benefit both non-smoking tenants and smoking tenants without jeopardizing what the tenants pay for, a home. A smoking tenant has the same amount of rights as a non-smoker. Both pay rent, and both should be able to be comfortable in the home environment they pay for. In this article, it's mentioned that it's just a bit of a nuisance to come home to possibly avoid something that could become an irritant. I suffer from asthma, and have been told by more than one doctor that it has gotten worse due to inhaling cigarette smoke from a neighboring apartment. Smoking is categorized as an irritant/trigger. The smell instantly seizes me up and often I get an attack. I would never want anyone to experience the pain that comes from these attacks. If it was me mentally causing it, I would love to know a way to resolve that. My personal belief is to separate the smoker's and non-smokers in the apartment complex. Have the buildings be for the specified tenants. This is nearly the same collateral that hotels use by having a floor/level for smokers. That way both maintain a comfort level that can be suitable and not adjust either persons lifestyle. Banning smoking is ridiculous. As expensive as it is to live somewhere and then apply a rule in your "home" that's unsuitable. I would rather come home to a place where I don't have to fear possibly visiting E.R. or even worse. so in the mean time are we suppose to smother. Oh, it sounds good but how do you stop a train? I moved into a lovely townhouse in the hills above Orange County, CA a couple of years ago, not knowing there were smokers living next door. At first I just couldn't believe what I was smelling! I had just signed a lease! But then, gradually, I came to accept that the smoke was coming across the roof, in the window, from electrical outlets. I notified the owner I and my wife would be leaving the next month. I cited common law in saying the home was not safe in that poison air was coming in from next door, and I could not be forced to endure breathing poison air for the next year. The owner threatened to sue. I told him go ahead, we'll make history together while we spend lots of money. No matter what, I would not subject myself and my new wife to smoke. Of course, he never did sue, though he was quite unpleasant. Turned out he could not afford to keep the home without my payments, and he gave it back to the bank. Smoking is an unpleasant and dangerous habit and innocent parties should not be required to breathe other people's smoke. I worked with a chain smoker for slightly less than one year. When my boyfriend would pick me up from work, he complained that I smelled like I just walked out of a bar. Shortly after, I found myself wheezing and short of breath after only walking my driveway, a short incline of aboiut 50 feet. I was diagnosed with asthma. I totally blame it on my co-worker and also my employer for providing me with an unhealthy work environment. Here's to making all public places smoke-free. Why not make an entire apartment building to accommodate smokers? and another to accommodate non-smokers? I live in a four/apartment unit in a retirement area. The lady living next door went to the nursing home and a gentleman was moved in. He is a chain smoker (filtered cigars) and now I am getting his secondhand smoke and having trouble with red irritated eyes, sore throat and sneezing. The lady living on the otherside of his apartment is having asthma and allergy attacks. She has heart trouble and wears a pacemaker and does not need this problem. We have complained to the landlord but we just get the runaround. They say he has the right to smoke in his apartment but does he have the right to make us sick? We are elderly and no one seems to be able to help us. Some one out there please HELP! Once again Anti Smokers pushing for something stupid. They shoud worry about their SUV they drive polluting MY AIR! See I can be a Nut Case too. Your values are really mixed up. The world is bad because of people who think like you. When are we going to care about each other and stop all the nonsense. If you want to kill yourself slowly you have my approval but don't take others with you. Go to a desert island and live, sounds like you love isolation and enbrace selfhate. Smoking is good for you . It harms noone . Inhaling burnt leaves with many carcinogenic chemicals is good for you . It also benefits young developing lungs and organs . Smoking is not a problem . It is the people who don't smoke who are the problem , they want smokers to stop smoking around them , around kids ...they are the problem . This is the general consensus from "Smokers" in these articles , listen to how stupid the initial comments sound , lets get real , smoking kills those who do it and those who are around those who do it . It's a no brainer !!!!! Smokers need to stop comparing their indoor smoking habits with that of automobile exhaust. Automobile exhause is usually not purposefully exposed to an enclosed indoor area, it is outside, and is a negative effect of transportation, which btw is a necessity. Nonsmokers do not take their cars indoors and let the exhaust fumes fill up an enclosed area, so please stop ocmparing indoor smoking with that of auto exhaust that autos emit on the road, for the love of god, there is no comparison. And for the ignorant people who refuse to stop making the comparisons...guess what?? when poisonous auto exhause is let into an enclosed space, people are poisoned from it and die. When poisonous cigarette smoke is let into an enclosed space people may not automatically die, but they are poisoned and may eventually die b/c of it. Smokers who smoke where they know it will be breathed in by others, basically smokers who smoke anywhere other than outside, are inconsiderate, unbelievably selfish, lazy and are affecting the health of others with zero regard. Smoker's do not want to face this fact only b/c it will inconvenience them. Disgusting in every sense of the word. Part 1: Is Second-hand Tobacco Smoke Seeping Into Your Life? What are apartment communities not disclosing to their potential tenants, and how is a landlord's silence severely harming your health? In search for an apartment, Mr. Paul Marshall and his wife Dianne noticed the various "no smoking" signage at Alexan Palm Valley Apartments in Texas. They also took special notice to what is stated in the lease, "You and your occupants or guests may not engage in the following activities: disturbing or threatening the rights, comfort, health, safety, or convenience of others." Delighted, Paul and Dianne settled into their Alexan apartment owned by Trammell Crow Residential/BCRE Palm Valley LLC, and on August 7, 2009 is when their nightmare began. In making their initial, official written notice to Alexan's management in August of 2009, Mrs. Marshall states, "There is cigarette or cigar smoke coming from our shared outside community spot, and the smoke is coming into our apartment through the windows that we like to leave open for fresh air." The Owner's legal team states, "The Owner's representative contacted your downstairs neighbor in an attempt to resolve the matter." They continue, "It is my understanding that your downstairs neighbors have limited smoking to outside their unit." Explains Mrs. Marshall, "The smoking outside is quite an issue for the both of us." The apartment management responds, "The smoke would also be able to go through a/c vents, etc. into your apartment if they were to smoke inside versus outside. Smoking on their patio as opposed to their apartment is the best case scenario. At least in this case all you would have to do is close your window when they are outside." In further discussing this matter with the Owner's legal representation, one of their attorneys states, "Part of the problem you have had is because you have left your window open, allowing smoke from outside the downstairs unit to come into the Premises." The Marshalls shared their pain with the Owners, "We have felt like prisoners behind bars (with having to close windows in order to breathe)." Is there anything that Trammell Crow Residential/BCRE Palm Valley LLC can do about the tobacco smoking outside? Stated in the Marshall's lease contract, "We may regulate: (1) the use of patios, balconies, and porches; (3) recreational activities in common areas." Yet, the apartment manager says, "I have no grounds to tell your neighbors that they can't smoke on their patio." Also in the Marshall's lease contract, "You and all occupants and guests must exercise due care for your own and other's safety and security." Who is Trammell and BCRE? Trammell Crow Residential ("TCR") is America's premier multi-family real estate firm. As further stated on their website: Since inception, TCR has developed over 225,000 multi-family units in most major markets across the country. TCR created the Alexan brand. Confirmed by the Owner's legal group, BCRE Palm Valley LLC is listed as the Owner of the Alexan Palm Valley Apartments in Texas. On April 12, 2010, The National Multi Housing Council recognized Boston Capital - the Boston-based real estate investment and advisory firm founded by Jack Manning - as the largest owner of apartments in the country. Boston Capital established Boston Capital Real Estate Partners ("BCRE") in 2002 to capitalize on its expertise in all facets of multifamily transactions. The Owners offered the Marshalls a transfer to another apartment unit, and why didn't the Marshalls accept this offer? Greystar is the property management company for the Alexan Palm Valley Apartment Community. Here's what Greystar's legal representative has to say. "Allow me to point out that you have previously been offered an opportunity, both on September 10, 2009 and again on September 28, 2009, to transfer from the Leased Premises to another unit at Alexan. You declined such offer." What is not mentioned by this attorney in his correspondence and is the deal-breaker for the Marshalls? As the Alexan management explains: "There would be no guaranty [sic] that your new neighbors do not smoke too." As an employee of Greystar puts it, "Management offered a transfer to another unit within the community, but similarly would have no assurance that a similar situation would not broach itself at a later date." Alexan management previously knew about the fact that Mrs. Marshall is blind. The acting manager at the time received this plea from Mrs. Marshall: "The cigarette/cigar smoke is becoming absolutely unbearable for me with my eyes paining/burning/watering (and, it is certainly challenging enough to be without vision and to have these other avoidable/unnecessary eye challenges really has an unpleasant compounding effect)." The Marshalls further state, "This issue is very serious as you may not be aware of our intense sufferings from the drugging smoke. Every day, we feel like we are being drugged forcefully." In a recent written correspondence dated November 29, 2010, the Marshalls explained to one of the Owner's attorneys the following: "It is egregious behavior to keep silent on health related matters, to have a client rent and then discover the danger to their health. After all of this ... it is unconscionable to present an opt out from the lease and to place the burden of time, effort and monetary output on us to move. If we were made aware beforehand of all the information we found out after August 7, 2009, we would not have rented at Alexan. Over the past 15 months, we have experienced tremendous and completely unnecessary discomfort in our living environment." Part 2: Is Second-hand Tobacco Smoke Seeping Into Your Life? Courts have repeatedly shown that rights are for where you are, to be enforced and obeyed there. The latter-stated is what Mr. and Mrs. Marshall desire. Knowing this fact and on more than one occasion, one of the Owner's attorneys says, "We look forward to hearing from you in the event you would like to accept the Owner's offer to terminate the Lease." The Marshalls would have to accept the following along with the termination offer, "... and release the Owner and the Owner's managing agent from all claims." After the Marshalls were offered an opt out of their lease and declined, here's what they received from one of Greystar's employees: "Gerald Elrod does work in air duct projects for the City of Austin and he can offer some insight as to how to best mitigate common air between units." Mr. Elrod performed the work in the Marshalls' unit. However, The Center for Energy and Environment and The American Society of Heating, Refrigeration and Air-Conditioning Engineers (the latter-stated is the body that sets the standard for indoor air quality) shows that ventilation technology is insufficient to protect building occupants from second-hand smoke. Was the apartment management aware of the effects from tobacco smoke? Alexan's management educates us on tobacco smoke's damaging effects to an apartment unit, and here is what they say in their own words. "Cigar smoke does extensive damage to the interiors of the apartment. Typically the carpet has to be replaced and special treatments done to the walls, cabinets and even window treatments when residents smoke heavily in their apartments." Let's find out if Alexan's management understands tobacco smoke's effects to peoples' health? In the words of Alexan's management: "Typically businesses that have a designated smoking area have one set up outside as opposed to inside so that any smoke can released [sic] into the atmosphere as opposed to an interior space where it would be more hazardous to people's health." Does TCR/BCRE have the ability to offer the Marshalls a healthier lifestyle at their Alexan apartment home? Here's what Trammell's managing director for Alexan CityView Apartments in NJ, Richard Murphy says, "We believe the decision to introduce this new building - which will be the only 100% smoke free rental offering in the state - will be embraced by a growing segment of the public that seeks a healthier lifestyle at home." Here's Alexan's mission statement: "Our Owners and Management Team are focused on creating value for each resident while enhancing their quality of life." However, according to one of the Owner's attorneys regarding Alexan Palm Valley in Texas, "The community is not a smoke-free community and the Owner has no intention of having the community be a non-smoking community." He also states to Mr. and Mrs. Marshall, "The Owner is sensitive to your concerns about the damages of smoking." Besides Alexan CityView, does Trammell Crow Residential have any other Alexan brand apartment communities that are non-smoking? Alexan Southwood in Florida is advertised as a 100% smoke-free community. Alexan Riverdale and Alexan Twenty-Four in Virginia have on their websites, "Clean Air Breathe Easier." On their websites ... Alexan Riverdale has, "Option to live in a 100% smoke-free building" and Alexan Twenty-Four has, "100% smoke-free community." An attorney for the Owners states, "The Owner cannot keep smokers from smoking in or outside their units." In the words of Greystar's property management, "Smoking is not a situation that we could directly control either now or in the future." Smokers (only 12% of Americans) are mentally ill and brain-damaged from tobacco addiction. Tobacco is ALREADY an ILLEGAL DRUG! Yes, still illegal to POISON people, no matter how slowly you do it. TOXIC TOBACCO SMOKE KILLS 65,000 INNOCENT AMERICANS EVERY YEAR! BAN ALL SMOKING, INDOORS AND OUT. THEN, BAN THE TOBACCO DRUG AND PROSECUTE TOBACCO PUSHERS FOR MURDER AND GENOCIDE OF THE HUMAN RACE! You are SO right, Gary! I saw a news article where the reporter began by saying that smokers should be shot on sight. I concur! You try smoking around me and I put the sharp-pointed tip of my steel-toed boot up your tobacco-stained behind! Thanks you made my day! How do we really fight the tobacco industry? Why would anyone defend their right to smoke? It's slow suicide. They might as well have someone put a pillow over their face and smother them it's the same affect but a lot faster. You definitely get some agreeable opinions and views. Your weblog delivers a fresh appear at the topic.